Well, that’s just the way it is, people – the Rolls were just never s’more-eating campers. My mom, who was in Girl Scouts as a kid, freely admits that she has never liked s’mores – it’s because of the marshmallows, she says. Granted, I’d kind of lost my taste for marshmallows as I grew up, so I know where she’s coming from. All that sweet gooey-ness gets to be a turnoff. So where did s’mores come from? Most sources seem to indicate that the s’more was first mentioned in print (supposedly as “some more”) in a book called “Tramping and Trailing with the Girl Scouts,” by Loretta Scott Crew, in 1927. So the s’more has been a staple of campouts, Scouting trips and any other event involving a source of open flame ever since – to the point that Aug. 10 is National S’mores Day. The treat’s even gone upscale; one of the Ritz-Carlton hotels announced that on National S’mores Day it would be serving sweet and savory versions of the s’more; read more about it here. I was in my senior year at Christopher Newport University (home of the Captains) and a member of the East Area Council, the event planning group for the East Campus: the upperclassmen’s dorms across the street from the main campus. We’d bought a ton of Hershey bars, graham crackers, marshmallows and packets of Swiss Miss cocoa, and a few boxes of bamboo skewers. The s’more ingredients and cocoa packets were parceled out into individual servings packed into zip-top bags. In between setting up the chairs and the big screen, and scrambling for Coax cable, we’d set up a steel drum with a fire burning in it – after getting all the okays from the fire marshal and the university police. It was a chilly night, so there were a lot of kids gathered around the fire. 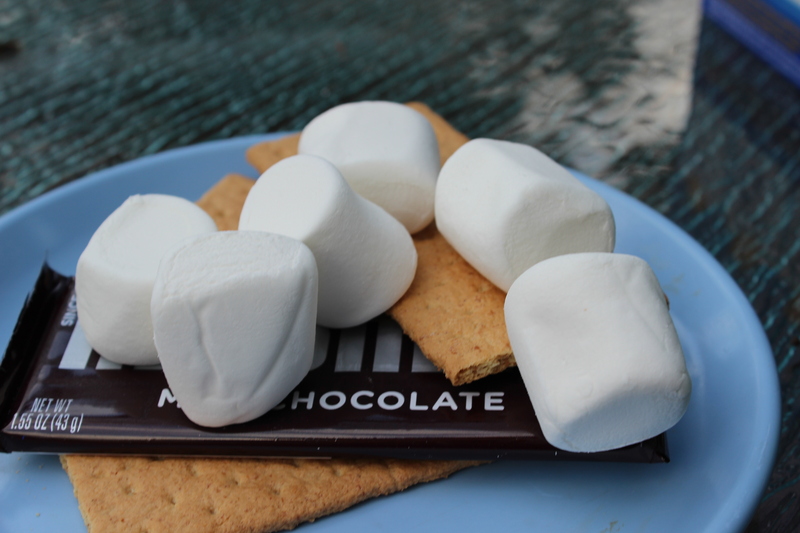 I took a skewer, toasted my marshmallow over the fire until it was golden-brown and slightly crunchy, the way I’d liked it as a kid, sandwiched it in between the chocolate and the grahams, and took a bite. It was good. One was definitely enough for me, but it was good. With s’mores, you’d think that there would have been too much sweetness, but the slight bittersweet flavor in the chocolate tempers some of the marshmallow. And the grahams add a nice bit of crunch.